Teachers jobs teachers recruitment test is online mode only. Interested candidates have to submit online applications from 30-10-2017 to 31-11-2017 through TSPSC Official website @www.tspsc.gov.in. Selection for Telangana State TSPSC PET Teachers Jobs Recruitment 2017 will be held through TRT written examination. 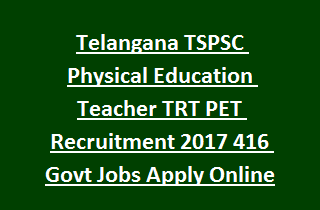 For more information regarding Eligible criteria, Age details, Exam syllabus, No of posts, Pay Scale of this Telangana TSPSC Physical Education Teachers PET recruitment Test are given below. TSPSC online application starting date: 30-10-2017. TSPSC Last date to submit applications: 30-11-2017. Examination Date (Objective Type): Feb 2018. There are total 416 vacancies of PET posts available in Telangana State Residential Schools. Post Name: Physical Education Teachers- 416 posts. School wise vacancies of PET posts are given below. Candidate must have completed Intermediate Examination/ its equivalent Education from a recognized board and Under Graduate Diploma in Physical Education from a recognized University/ Institution. The general candidate's age limits for PET Teacher jobs is 18 years 44 years and for all other candidates age relaxations are applicable as per Telangana govt norms. Selection for this TSPSC Physical Education Teacher recruitment will be based on written Examination (objective Type). Total 200 questions will be given int TSPSC PET TRT Exam. Total exam will be conducted for 100 Marks. Pay Scale for this TSPSC PET Teacher Jobs recruitment is Rs. 21,230- 63,010/-. Examination fee is Rs.800/- for General Candidates and other candidates is nil. Candidates having required qualification can submit online application through Telangana PSC official website @www.tspsc.gov.in. Before applying online generate one time registration OTR number through TSPSC website. If you already have OTR, login with this OTR number otherwise create new one. Submit the application form through online along with required documents before last date.